Crawl space ventilation in Indiana was based on the idea that installing foundation vents around the perimeter of the crawl space foundation would allow for outside air to flow through crawl space, which in turn would allow the crawl space to dry out by allowing more air to circulate through the crawl space. But here in Indiana, the opposite is true and here’s why. During the spring and summer months in Indiana, the outside air tends to be very hot and humid. Humid because of the relative humidity or the moisture that this outside air has in it. Your crawl space on the other hand tends to be relatively cool year round due to it basically being a large hole in the ground. Crawl space vents allow this hot and humid outside air to flow into your crawl space carrying with it the high levels of moisture that is already in the air. This alone introduces your crawl space to additional moisture by allowing the wet, hot outside air to flow into your crawl space. Additional moisture is also created in the crawl space due to the fact that this wet, humid outside air is now mixing with the cooler air in the crawl space. Outside air mixing with the cooler air in the crawl space causes additional moisture due to the fact that for every (1) degree that warm air is cooled, the relative humidity increases by 2.2 percent. When the relative humidity of the air in your crawl space exceeds 100%, the moisture is released from the air in the form of actual water or condensation. 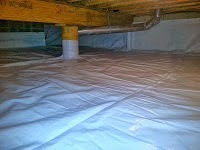 Examples of this can be seen in the crawl space on duct lines and pipes in the form of condensation. Based on these facts, we can now take a look at an example of an average size Indiana vented crawl space and how wet, humid outside air can affect the moisture levels. Let’s assume the outside temperature in the air is 80 degrees with a relative humidity of 80%. And we will assume the air temperature in the crawl space is 65 degrees. The difference in the temperature of the outside air versus the crawl space air is 15 degrees. We now know that for every degree the warm air is cooled, the relative humidity increases by 2.2%. If the outside air is cooled by 15 degrees, that creates an additional 33% increase in the relative humidity of the outside air once it makes it way into the crawl space. Which increases the overall relative humidity for the outside air to 113% which is impossible because once the relative humidity reaches 100%, moisture is released from the air in the form of water or condensation.